We fear the unknown. It is a truism from fairy tales to military strategy. The other, the alien, the undefined sets people on edge. It is also apparent in the recent reaction to the Paris attacks and the attacks in Africa and the Middle East. It is leading to a dangerous and misguided narrative around migrants and Muslims. For some this is a narrative built on racism. For some it is clearly fear-mongering for political gain. It ignores the facts (such as 18-24 month background checks-more review than any other entry point into our nation) and frankly ugly truths (a clear bias of one religious affiliation over another). However while the “fear the Muslim” narrative is abhorrent and must be challenged for the good of the soul of this nation, I want to talk about a parallel narrative. It is one that librarians can have a powerful role in countering and in crafting an alternative narrative that ensures the values we hold as a profession. We must directly challenge the narrative of freedom versus security. The security narrative flattens the complexity of preventing harm to citizens as a choice: give up some freedoms to ensure security. Give us (the government) your private information, your freedom of transport and right to assemble and we will take care of you. These freedoms, so goes the argument, are not really losses since if you have nothing to hide, you have nothing to fear. 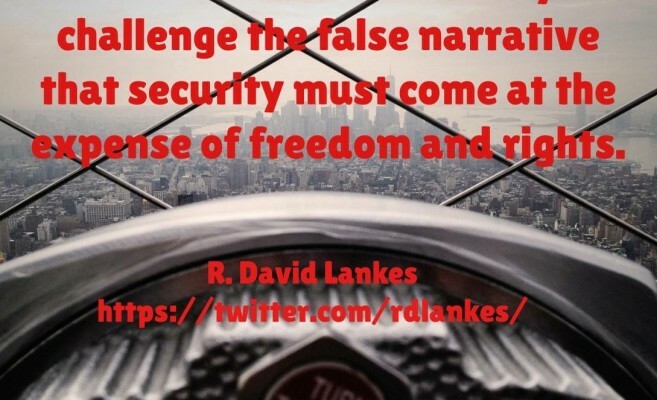 The narrative is a false dichotomy: it is either freedom or security. The primary flaw in this narrative is the belief that security ONLY comes from restrictions of rights and freedoms. This is a misguided as the racist and reactionary belief that terrorism only comes from the Muslim faith, ignoring both the overwhelming number of Muslims that condemn violence and the terrorism perpetrated by Christians and other religions. Terrorism has nothing to do with a love of God, but of a hatred of our fellow man. Librarians must craft a narrative of security through knowledge. Every day I work amongst Muslims and Buddhists, Christians and Jews, atheists and deists and I’m sure a bit of Wicca thrown in as well. I stand shoulder to shoulder with a diverse body of faculty staff and students every day. A large portion of our student body comes from India and China. We have students from the Middle East and the former Soviet Block. I stand without fear because we are all a part of a common community bound around knowledge. Many will rightfully point out that this is a privileged community. In essence I stand with people able to afford and have access to higher education. It is a fair point. So I ask, instead of this invalidating my point, why not ensure equitable access to knowledge and learning to all as a way of countering hate, and insecurity. Neighborhood watches shouldn’t be citizens looking out for strangers, but libraries working to introduce strangers and transform them into allies. Librarians can’t simply fight the surveillance state, they must model an alternative where openness of debate and ideas brings security. As librarians we shouldn’t be seen as simply obstructing the work of security, we should be seen as pillars of security through knowledge, learning, and community engagement. Library cards instead of ID cards. Databases of articles instead of databases of Muslims. In times of crisis libraries are places of refuge AND places that fight disinformation and paranoia with facts and research. This is a constructive narrative that transcends political point of view or party. It is a narrative that says to our communities (towns, colleges, schools) we are keeping you safe by making you smarter. Dispelling the unknown, the dark woods, the other, the alien is a click and visit away. We are havens not to escape misinformation and fear, but havens from ignorance where you can embrace your fellow community members and build a strong diverse community.